If you want to see tulips and historical buildings in the same frame, go to Sultanahmet now. Earlier this week, I had to run some errands in the Sultanahmet area. Luckily, I grabbed my good camera as I was heading out the door. The springtime tulips I shared the other week on My Turkish Joys Facebook page are now fully open. 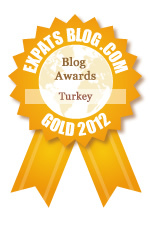 I’ve also heard from a friend that many of the tulips in Emirgan Korusu (Park) are blooming as well. Normally, April is the peak time for Istanbul’s tulips, but it looks like everything is blooming a bit earlier this spring. When I was by the Blue Mosque, I had to crouch down low so I could get the pastel tulips in the same frame as the mosque. Of course as I was doing so, I had two cute street kitties wander into the photos. I can’t resist taking photos of the abundant Istanbul street cats as seen here in the Çukurcuma neighborhood. I almost wish I could be chilling about in the grass and flowers like this cat. Here are a couple more tulip photos from my outing. Enjoy! Another view of the Blue Mosque and tulips from the Hippodrome area. I approve of this re-embracing of the tulip. beautiful photos! it is snowing here right now! Waoow! I'm jealous. It's still cold here in Toronto. We have such long winters! I can't wait to move to Istanbul for more temperate climes. Nice pictures. What beautiful pictures! Thank you for sharing. Just lovely, Joy!! 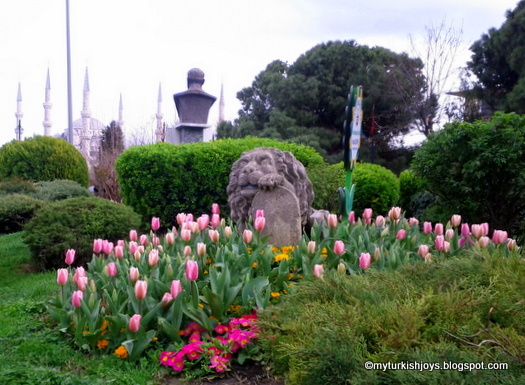 Is there anyone who doesn't adore tulips, especially with the backdrop of Sultanahmet to boot! Fab photos. Tulips just scream spring! Love them! I can't wait to be there end of May. I guess the tulips will be gone but hoping the weather will be cool and nice. Beautiful images! I can't wait for the weather to cheer up again, so that I can take some tulip photos. They are so much earlier this year! Our tulips here are still only a tight, green bud.